In 1980, Wakatere Boating Club sent a team of sailors to New York, to sail in the Centennial Dinghy Team Regatta at the Larchmont Yacht Club, where they used “Interclub” (Frostbite) dinghies, with five boats per team. Elizabeth and Robert Brooke were part of the team. Kohimarama Yacht Club, an on the water chat between Robert Brooke and Trevor Geldard, Managing Director of Healing (Epiglass) re setting up a Secondary Schools Teams Racing event led to an approach to Harold Bennett, NZYF Training Officer, the Wakatere Boating Club, the administrators of the Auckland Intersecondary Schools Yachting Championship Series and the Sunburst Association, with a view to establishing a National Secondary Schools Teams Racing Regatta. Support was also gained from the Education Department and the Secondary Principals Association enabling sailing to be recognised as a sanctioned sport. The Secondary Schools Yachting Association of NZ was established and an administration committee formed. Robert, a senior teacher at Westlake Boys High School and chairman of the SSYANZ, travelled the country during the 1983 August school holidays, visiting the regions to introduce and market the concept, also taking with him a new ‘plastic fantastic’ Sunburst yacht. Harold Bennett also promoted the plan to clubs as part of his position as NZYF National Training Officer. The country was organised into 17 regions. Each region would hold a fleet racing regatta with the winning school representing the region at the new National Teams Racing event. 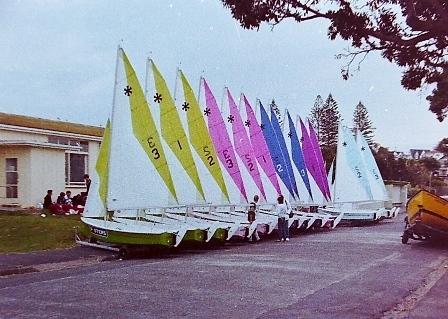 Hence, the annual Epiglass National Intersecondary Schools Teams Racing Championship was started, with Healing Industries providing sponsorship in the region of $40,000, including the supply of specially built Sunburst yachts and an abundance of support to assist its establishment and structuring within the regions. 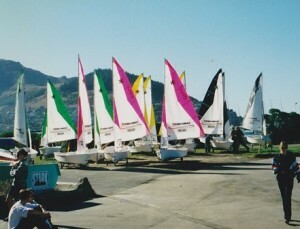 The Sunbursts were then on-sold to individual schools who resupplied them to following National regattas. Healing Industries were also fundamental in setting up secondary schools’ team sailing in provincial Australia and the initiation of the Inter-Dominion Contest. Now an annual event hosted alternately by each country. Epiglass provided continuous sponsorship for 17 years. Maersk Sealand was the main sponsor for the next 5 years and Mahurangi Technical Institute was active in their support for 12 years. 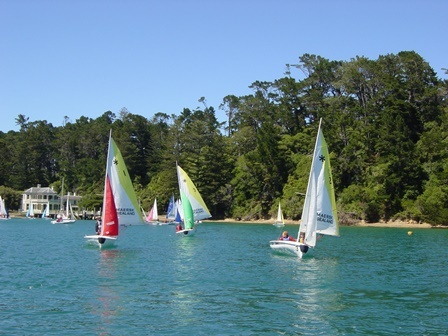 Facilitation of the contest was vested in Yachting New Zealand (then NZYF) in 1987 and from 2004 the contest has been run by the New Zealand Team Sailing Association under the umbrella of YNZ, as per other classes of yachts. The contest evolves from time to time, including development of a different course structure from the original triangle, to a box course and more recently to a right-hand S to allow continuous and more interesting racing. Initially there were no umpires leading to drawn out protest hearings after racing. On the water protest panel observers were introduced, before on the water judging was introduced in 1992 and the adoption of a ‘no appeals to protests’ policy earlier. When Sunbursts were used, to keep the pool of boats as equal as possible, only boats built off a particular mould were used. When the hull mould was changed, NZTSA looked for a viable alternative which would also be a Youth Class boat supported by YNZ and suitable for International competition. The 420 class was selected. NZTSA now supplies the bulk of the 420’s used. These boats were purchased for the ISAF Team Racing Worlds held in Auckland in 2003 and are held in trust by the association for team sailing events. Coloured sails, purchased with money from sponsors, are also provided to keep the contest even. Up to 2003, schools competed in regional trials in 17 regions initially, plus a Cook Island team was invited. A new initiative designed to increase participation of girls was introduced in 1994 with the creation of three new zones enabling girls’ teams to win selection directly to the national finals and making a total of 22 possible teams in the Nationals. Margaret and Jim Park, (chief umpire for many years), donated a trophy for the top girls’ team. Owing to the uncertainty of winning regionals and then having to fund entry to the Nationals, team entries fell to about 13 teams in the 5 -6 years prior to 2003. In 2004 the open format was adopted and more lately teams are seeded into ranked fleets running on 2 courses. 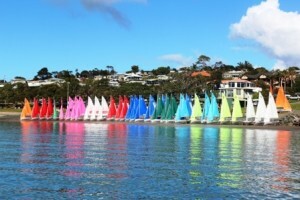 Initially the Nationals were held for 2 successive years in the North Island followed by a year in the South Island. Over the years venues have varied up and down the country from Dunedin to Whangarei, with 10 other centres in between. Recently, with the open format increasing team numbers and therefore organisational problems. it has been found much more efficient to focus on a couple of centres Taupo and Algies Bay. However, the event has grown to now involve participation by more than 30 teams and involving over 50 secondary schools New Zealand wide. The Secondary Schools Team Sailing National Championship is a complex regatta, requiring a high standard of International and National judging. The New Zealand Team Sailing Association and Yachting New Zealand are extremely appreciative to our sponsors and to all the volunteers contributing to the continuing success of this prestigious event.